Unionized support staff at Ontario's community colleges went on strike Thursday morning just days before students return for a new school year. The Ontario Public Service Employees Union represents about 8,000 support workers at the province's 24 colleges who help with registration, student loans, disability support and food preparation, among other services. Dozens of workers walked the picket line outside Algonquin College in Ottawa Thursday morning chanting repeatedly: "What do we want? A contract. When do we want it? Now." The OPSEU insists it will be a 24-hour strike at all colleges across the province. "I believe it will have a huge impact on students because we are the backbone of the college," said Jan Strickland, president of OPSEU Local 416 and support worker at Algonquin College. "We get to know the students well, they're like our kids." The colleges say they will continue to operate during the strike and have plans to help students move into residences this weekend and deal with any disruptions when classes resume on Tuesday. "We expect that there will be delays getting into the campuses and that there will be probably slow downs in regards to the services that are provided on campuses but we do expect that the colleges will remain open," Rod Bemister, chairman of the OPSEU bargaining committee, said early Thursday. Gerry Barker, chairman of the colleges' bargaining team, said the colleges offered increases for support staff that would take the average salary to more than $59,000 a year with no concessions. "Very, very disappointed that we were not able to reach an agreement. I honestly believe that what we put on the table was a good and fair offer," Barker said in an interview. He said the dispute cannot be settled on the picket line and that both sides must return to the bargaining table. The union said it went on strike because the colleges demanded concessions and clawbacks to its existing contract. "We tried to reach an accommodation with management negotiators but it became very clear as we approached the strike deadline that they were not prepared to meet us on terms we could accept" Bemister said in a release. "We are prepared to return to negotiations at any time but management must adopt a fresh approach." Ontario Federation of Labour president Sid Ryan chimed in on the labour dispute early Thursday by saying OPSEU is "taking a courageous stand to protect the future of work in Ontario." 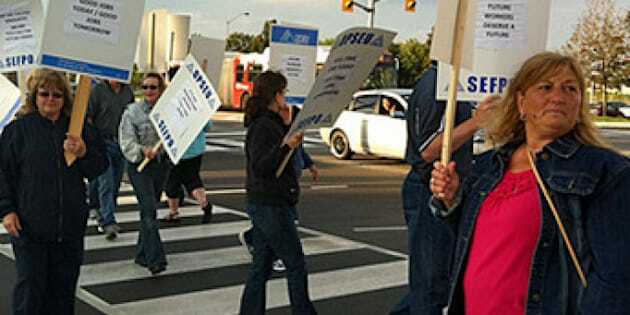 Ryan will join striking support staff Thursday at Durham College campuses in Whitby and Oshawa. OPSEU president Warren (Smokey) Thomas will also join striking staff at a rally Thursday at a downtown Toronto campus of George Brown College.